Platelet-rich plasma (PRP) for hair loss is a proactive hair rejuvenation option Pensacola Wellness Solutions offers to both men and women of Pensacola and the surrounding area in Florida. Is PRP Hair Loss Treatment For Me? If you have visibly thinning hair, weakening hair strength, a decrease in hair volume, or loss of scalp coverage, you may be a candidate for PRP Therapy for hair restoration. PRP contains special cells called platelets that can cause growth of the hair follicles and/or stimulate inactive or newly implanted hair follicles into an active growth phase. 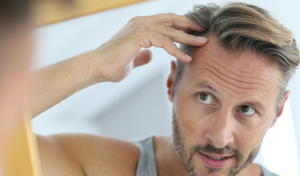 While individual results vary with each patient and no guarantees of success can be made, PRP Therapy continues to gain momentum as an all-natural treatment option for hair loss with significantly positive results. PRP therapy has been growing in popularity over the passed 20 years in surgical and medical fields, but deciding if PRP hair treatments are right for you should only come after speaking with medical professionals and doing your own research. Call us today to schedule your one-on-one consultation! Each patient has differing needs, so costs vary from patient to patient. Call us today or schedule your appointment online to discuss the costs as they relate to your specific needs. Our helpful team is available and would be happy to discuss your options or address questions and concerns you may be having. Yes. The use of other medical therapies along side PRP treatment as a complement to nonsurgical approaches is a great solution for those ineligible for hair restoration surgery or who want to wait to have surgery.